ROME (AP) Roma pulled off an extraordinary comeback to knock Barcelona out of the Champions League on Tuesday, winning 3-0 at home to reach the semifinals by overturning a three-goal deficit from the first leg. Roma advanced on away goals despite losing 4-1 in the first leg of the quarterfinals. Center back Kostas Manolas scored the decisive goal with a header from a corner in the 82nd minute amid a deafening atmosphere inside the Stadio Olimpico. Roma coach Eusebio Di Francesco acknowledged before the match that his team needed a ”miracle” to advance, and they got the start they needed when when Edin Dzeko controlled an over-the-top pass between two defenders after six minutes and poked in his sixth goal in this season’s competition. 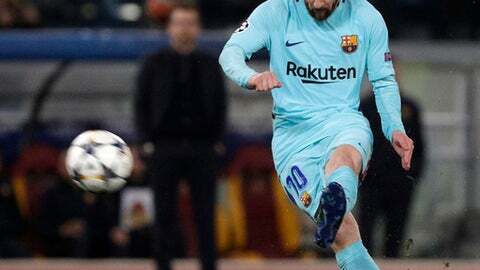 Barcelona forwards Lionel Messi and Luis Suarez hardly threatened as Roma dominated possession for long stretches and stifled the Catalan club with high pressure. Roma captain Daniele De Rossi set up Dzeko’s goal with a straight ball and the Bosnian striker muscled off defenders to shoot past Marc-Andre ter Stegen with his left foot. Barcelona’s only real chances of the first half came from two free kicks, both of which Messi missed high. Shortly after the half-hour mark, Roma fans protested for a perceived hand ball inside the area but it appeared that Samuel Umtiti used his chest to deflect a shot from Schick. It was De Rossi’s first Champions League goal since October 2015. Roma substitute Stephan El Shaarawy had a chance at Roma’s third in the 79th but Ter Stegen produced a brilliant save to deny the striker from close range. But three minutes later, the Barcelona goalkeeper had no chance when Manolas headed inside the far post.